Computers linked to networks have created the first broadly used systems that allow individuals to create, distribute, and receive audiovisual content with the same box. They challenge theorists of digital culture to develop interaction-based models to replace the more primitive models that allow only passive use.The Digital Dialectic is an interdisciplinary jam session about our visual and intellectual cultures as the computer recodes technologies, media, and art forms. Unlike purely academic texts on new media, the book includes contributions by scholars, artists, and entrepreneurs, who combine theoretical investigations with hands-on analysis of the possibilities (and limitations) of new technology. 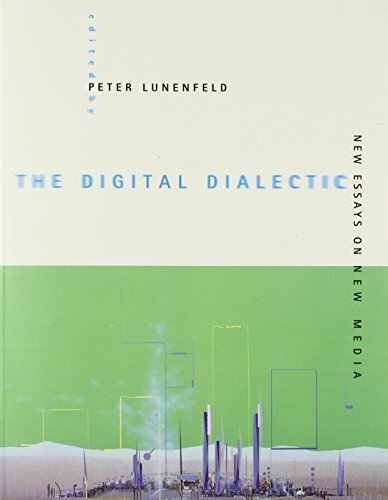 The key concept is the digital dialectic: a method to ground the insights of theory in the constraints of practice. The essays move beyond journalistic reportage and hype into serious but accessible discussion of new technologies, new media, and new cultural forms.Contributors: Florian Brody, Carol Gigliotti, N. Katherine Hayles, Michael Heim, Erkki Huhtamo, George P. Landow, Brenda Laurel, Peter Lunenfeld, Lev Manovich, William J. Mitchell, Bob Stein. "This book delivers in grand, thought-provoking style... an entertaining, unqualified success." -- Geoff Rotunno, "Library Journal"
Peter Lunenfeld teaches in the Graduate Program in Communication and New Media Design, Art Center College of Design, Pasadena, California. His column, "User," appears in art/text. Contributors Florian Brody, Carol Gigliotti, N. Katherine Hayles, Michael Heim, Erkki Huhtamo, George P. Landow, Brenda Laurel, Peter Lunenfeld, Lev Manovich, William J. Mitchell, Bob Stein.